Autumn Harvest was the last design used on refrigerator dishes before these dishes were discontinued. Autumn Harvest was the only design with a Store N’ See canister set. Autumn Harvest had a predecessor in the promotional release of “Wheat” in 1978. Autumn Harvest, designed by Richard Hora, entered the market in 1979 on several sets including the Cinderella bowl set (440), both the three and four-piece mixing bowl set (300 & 400), the Bake, Serve & Store set (470), the casserole set (480), the two oval casseroles (943 &945) and the refrigerator set (500). 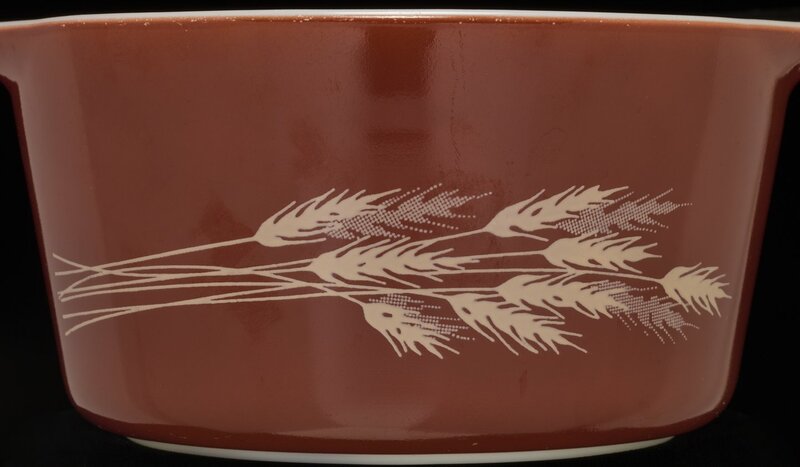 Autumn Harvest was the last pattern to appear on Pyrex opal ware refrigerator sets. Individual mixing bowls in the 400 series were sold outside of the sets, but always in the rust colored background rather than the alternating background colors of rust and orange used in the multi-piece sets. These open-stock bowls were introduced in 1980 and continued for about five years. Autumn Harvest also incorporated a series of Store N’ See canisters, the only time a Pyrex design was used in lieu of Corning Ware patterns or solid colors. Autumn Harvest, while abundant in various sets, was not the first pattern released with wheat as its design motif. A year earlier in 1978, an oval casserole named “Wheat” was released in a promotional gift set. Wheat has a tan on brown color scheme while Autumn Harvest has an ivory on rust or orange scheme, but both have the same printed pattern. In 1986, production on all opal Pyrex was discontinued, ending the distribution of the Autumn Wheat design.